When I go for a walk in the evening, I look in the windows of houses that forgot to draw the blinds. I sneak peeks at what you have in your shopping cart when I’m standing in line behind you. And if you’re a writer, I wish I could see where you write. Writing is something of a secret vocation. Sure, authors today are expected to blog & tweet & Facebook their every thought, but the writing itself takes place behind closed doors. Behind the page, as it were. There’s something magical about the site of creation. Granted, we writers tend to have slightly less fabulous workspaces than visual artists, but in some ways, that makes it all the more mystical (or do I mean mystifying?). To satisfy this unnatural curiosity of mine, I’ve decided to start a series about the workspaces of literary folk. Look into their spare bedrooms, their basement lairs, their frozen garrets, their comfy couches, and read the secrets of their souls. The first victim who has volunteered to bare his tender interior spaces for your salaciously inquiring eyes is David Rees-Thomas, Fiction Editor of the brand-new Waylines Magazine. He’s also a writer of science fiction, fantasy, and mystery. He used to be the managing editor at Ideomancer magazine. 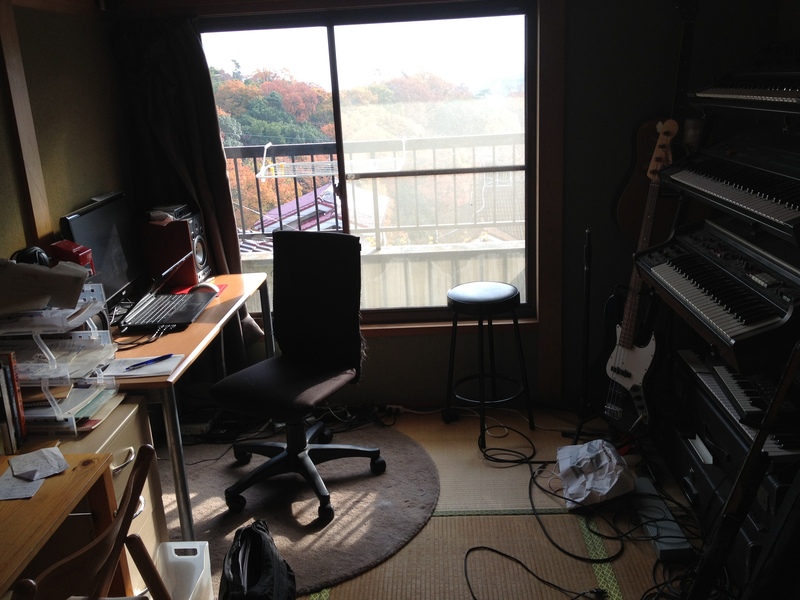 He lives in Japan, and likes to build and collect old synthesizers in his spare time, which is not as much as it used to be. His musical endeavors can be found under the moniker, Phenotypo. “Bashing the elderly and infirm with my laptop bag usually secures me a seat,” says David. So, a new spec fic magazine, huh? Why? Waylines Magazine came about as the logical result of me and Darryl Knickrehm getting together and talking SF/fantasy and all that jazz every week. There are a ton of great writers out there, and there’s always room for another magazine to highlight their wonderful stories. Darryl has a background in film and art, and we are editing the magazine as a team. We trust each other’s opinions, and each of us brings a different take on an individual story. We are both big fans of mags like Clarkesworld, Asimov’s, Lightspeed, Shimmer, F&SF, Apex, Analog, Strange Horizons, and on and on. Oh yeah, and, of course, Ideomancer!! We’ve been inspired by all these guys, and we also want to do something just a little different by including film as well as fiction. Who is the ideal reader of Waylines? Well, I want to say everyone! A more fun answer is that we thought we knew what we liked, and part of the enjoyment of this journey has been discovering new stories that made us stop, nod our heads, and go, Yes! Yes!! Darryl has a soft spot for cyberpunk, the Twilight Zone, and Heavy Metal magazine. I have a soft spot for Ursula Le Guin, Samuel Delany, and Jack Womack. Go figure! What do you wish you were reading, but aren’t (because it doesn’t exist)? Ooohh, that’s a tricky question. Alright, here goes: More science fiction by authors from Wales. I grew up in Caerphilly, near Cardiff, a proper valleys boy. I also lived in Aberystwyth on the coast. We have a rich tradition of storytelling in Wales, so it would be great to see more from my homeland. Of course, this is not to suggest it doesn’t exist, or that we don’t already have great science fiction and fantasy writers–Alastair Reynolds, David Langford, the rather fascinating Rhys Hughes, and not to forget Islwyn Ffowc Elis, who wrote science fiction in the Welsh language. There must be so much more out there!! Tell us about your editing process. Or your writing process. Or both. Divulge. On a typical day, I get up, make coffee, check Waylines’ submissions. Deal with any correspondence, reply to a few submissions, wonder what the strange humming noise is, realize I’ve left the bass amp on again when the cat brushes her tail against the G string. Take a shower, write my morning 200 words, more coffee, make notes on all the Waylines madness to do during breaks from the day job. Get on the train. Write until I get to work. I am worried that in the future, I will not be able to write unless I’m on a train!! I typically work in the day job from about 11am-7:30pm. I get some writing done and read second round submissions when I have a lunch break. Then on to the train again. Careful strategic positioning usually bags me a seat one stop after I get on the train. Then, it’s out with the trusted, dying, little netbook, and down to more writing. Once I’m home, dinner, some admin, editing, correspondence, and other bits and pieces until about 10:30. Then I relax. Whew! Both Darryl and I edit the magazine, so if we think a story has something we like, we bump it to the second round of submissions, and inform the author. Things slow down a bit at this point. We read the story, make notes, and make a decision when we have our weekly meeting. If we like it enough, we move on to the next stage, acceptance and editing. Darryl and I are in text message contact over our phones all day. 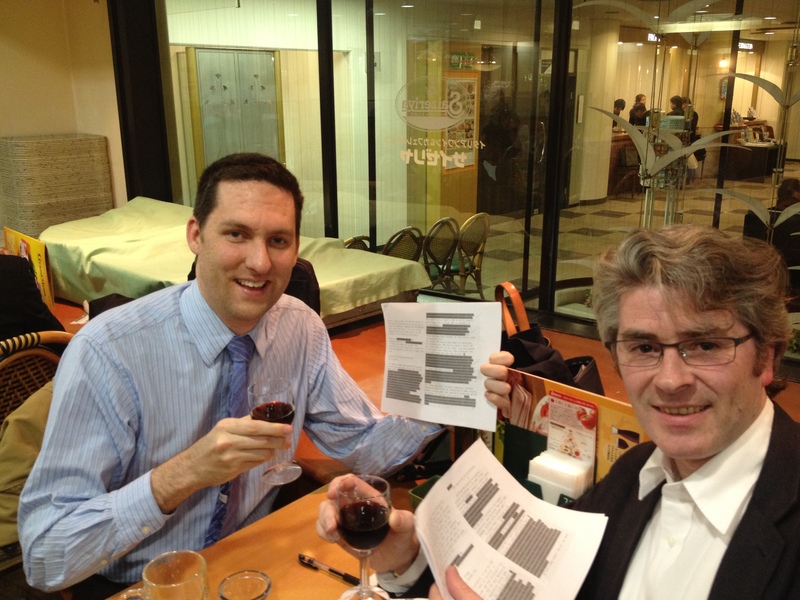 We have a weekly meeting every Wednesday evening, in a cheap Italian restaurant in Umeda, Osaka. Note, we do no editing when drinking the wine. What’s it like living in Japan? How does that affect your writing/editing? We’ve both lived here for quite some time now, so the boring answer is that it’s probably much like living anywhere else. I’m originally from Wales in the UK. Darryl is from Orange County, California. Beyond the temples, shrines, and the cyberpunk pachinko assault on the senses, it’s a country where people have the same everyday troubles and celebrations as your own place in the world. We live in the Osaka area, which is more down-to-earth and rugged than Tokyo. Good food, straightforward people, and possibly the ugliest, most fabulous skyline in Japan. Your prediction for the Mayan Apocalypse? Well, it appears to be a Thursday, so assuming this doesn’t happen, then it will be a day like I outlined above. There shall also be miso soup and red wine consumed, as well as a good chance of some 1956 B movies on the TV at home, and a few parts going missing from the synthesizer I’m building as I attempt to do some soldering at 11:30 at night. Perhaps that’s enough to herald an apocalypse by itself. What should a reader do after reading this interview? Bookmark our page. We really want to make Waylines something that will be enduring, something magnificent, something to make the gods themselves tremble!! Uh, seriously though, please do pop along, it would be lovely to see you. We have plans for the first year, into year 2, and even a few years on from there. We’re also running a Kickstarter until Dec 6th. If you cannot suppress the urge to really help us out, please take a look. It’s worth it just for the video. Our bare bones goals will enable us to pay our authors semi-pro rates, but more will allow us to increase our rates to pro paying level, which would be wonderful. Categories: Writer's Rooms | Tags: Alisa Alering, David Rees-Thomas, Fantasy, Science Fiction, Short Stories, Speculative Fiction, Waylines Magazine, Writing methods | Permalink. 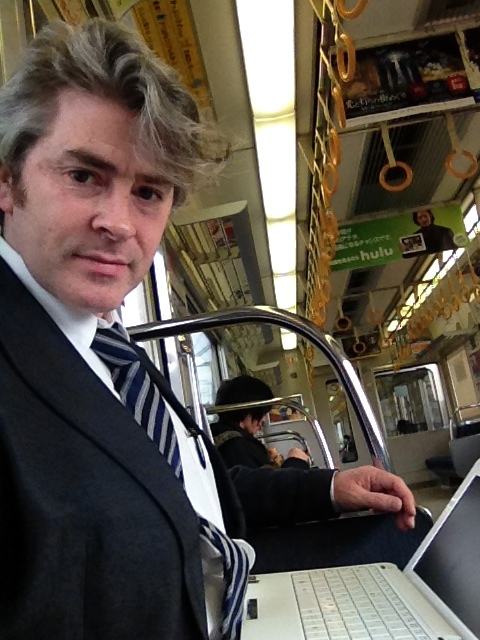 I have a question for David Rees-Thomas. Which would you rather fight, one horse-sized duck or 100 duck-sized horses? Also consider the Trojan Duck, filled with 100 tiny horses. How about the ducks that merely look like 100 horses? Are they armed? Stop writing jokes and start writing books. Get back to work. If your oeuvre is anything to go by, writing jokes is an essential part of writing books. Rock stars, all of you! How did I walk into my own trap like that? Alering is too crafty….